Professor Andrew Forbes from the School of Physics at the University of the Witwatersrand won the NSTF 2014/15 special Annual Theme Award for an exceptional contribution in photonics research (photonics refers to the harnessing of single particles of light). He is regarded as an international expert in laser-beam shaping and heads a research programme investigating digital holography, optical communication, optical trapping and tweezing, and high-dimensional quantum entanglement. Prof Forbes is committed to driving photonics in South Africa, and plays an important part in outreach and public education. He has given numerous talks and demonstrations at primary and high schools, as well as at science shows, and includes the general public through lectures and the media. 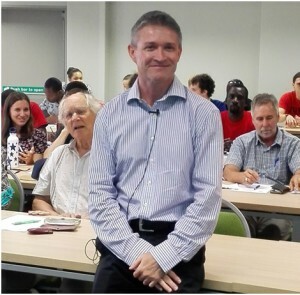 On 4 December 2015, Prof Forbes presented a Science Café talk at Stellenbosch University on the topic “Communicating light”, in celebration of the International Year of Light and Light-based Technologies. This event concluded the “Science Fridays @Stellenbosch” initiative that is a platform for discussions of science communication. As a result, the audience consisted mainly of people with science communication at heart, as well as physicists. Prof Forbes elaborated on how people could benefit from light, emphasizing that most of Africa is light-poor. He said that we are in the century of photonics, which is the sciences of light, and the most cost-effective and clean form of light that holds promise to light up Africa. Prof Forbes pointed out that photonics has revolutionised medicine with “cellnostics” that introduced a move from social media to social health. Through a downloadable app, individuals can receive a preliminary diagnosis of a skin condition based on interrogation of health databases. He also spoke about various experiments where his students use water and paper with photonics to decrease the size and weight of lenses. The aim is to develop a paper-thin mobile phone. Another important area highlighted by Prof Forbes is the less-known term “li-fi” technology which is a ground-breaking light-based communication technology that makes use of light waves instead of radio technology to deliver data faster and in greater volume – the future Internet. In terms of tertiary education, Forbes has delivered photonics course lectures at various universities to promote the subject matter. In 2009, he started a project to introduce photonics into previously disadvantaged institutions. Due to this intervention, the University of Fort Hare has its first photonics course at fourth year physics level, has graduated its first MSc students, and now has its first PhD students. The intention is to expand the programme to other institutions. Within Africa, Forbes has organised and hosted several African photonics training workshops, delivered special courses and lectures, and has co-hosted the annual African Laser Centre Student Workshop for the past several years. Click here to read more about Prof Forbes’ work, or listen to a podcast of an audio interview with him.